"Town and Country" style Hawaiian Sunrise Shell with Puka Shell and Swarovski Crystal pendant! This Sunrise Shell is a beautiful top shell with bright color and bumpy, ruffled ribs measuring one full inch, and is accented with a shiny white North Shore Puka Shell and an amber colored Swarovki Crystal for a little added sparkle! 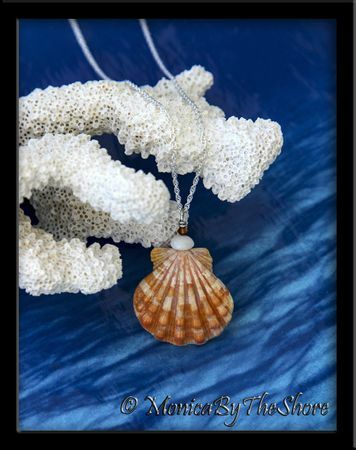 The seashell pendant drapes from an 16 inch sterling silver rope chain necklace. Perfectly beautiful detail in this shell! Get ready for compliments! Hawaiian Sunrise Shell jewelry that can be worn in "Town" or "Country"! 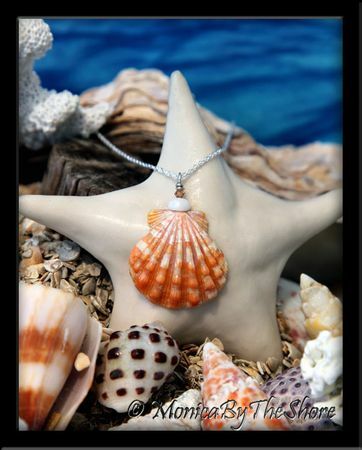 Hawaiian Sunrise Shells jewelry designs by MonicaByTheShore of Haleiwa, Hawaii. Each piece is hand crafted with Aloha in Haleiwa on the North Shore of Oahu, and Honolulu, Hawaii.